Whistler has ski accommodations for everyone, from smaller hotel rooms and studios to luxurious 6-bedroom resort homes, we can find the most suitable ski property for your group. 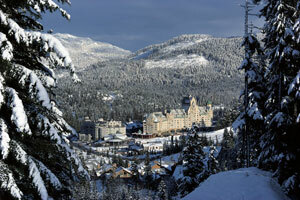 Our recommended area to stay is in the Upper Village on Blackcomb mountain in the prestigious Benchlands. This area is quieter and there are ski-in and ski-out properties available giving you access to the awesome ski terrain Whistler Blackcomb has to offer. Other available areas are Whistler Village and Whistler Creekside each with lifts or gondolas accessing one or both of the mountains. Ski accommodations in Whistler Creekside have the lowest rates but you are out of the main Whistler Village centre. We have only listed a select few ski properties for you to view as our inventory is extensive. Contact us with your preferences and we will do the rest to ensure your Whistler Ski Holiday is memorable. Whistler Village is serviced by a regular FREE village shuttle which means you do not need a car rental. Most ski accommodation complexes have a stop nearby or at the entrance.